Proper dental hygiene is critical to a child’s overall health. From preventing tooth decay and cavities to acid reflux and cardiovascular issues, oral health contributes to a healthier body, overall. At Woodburn Pediatric Clinic, we believe that good oral hygiene habits should begin at a young age. Along with healthy habits like regular brushing and an avoidance of sugary drinks, we encourage parents to bring their children in for our pediatric fluoride applications. As a part of their well-child check-ups, children of 9 months and 15-18 months will receive a fluoride varnish, which decreases the likelihood of cavities. The application takes only 30 seconds to apply and the varnish does not contain dyes or preservatives. To learn more about our pediatric fluoride treatment, call us today. Woodburn Pediatric Clinic is dedicated to your child’s oral health, and we want to help parents establish healthy habits with their children, beginning as early as infanthood. Along with helping your child brush twice a day, we have a variety of healthy oral habits you can begin teaching your children. Read through our oral health guide for tips! Poor dental hygiene can cause pain and discomfort, eating and speech difficulties, a poor self-image, and it can begin affecting your child’s health long-term, beyond tooth decay and gum disease. 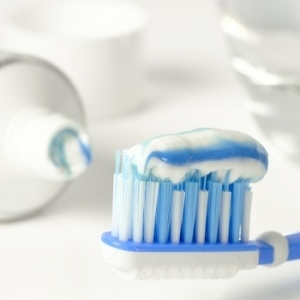 It’s never too late to begin establishing good oral health. Schedule a pediatric Meet & Greet today to begin your child’s journey towards long-term overall health.